A few months ago I was watching one of those National Lottery game shows, presented by the sinister Eamonn Holmes, where one of the contestants was a wheelchair user. Some days afterwards on Ground Force, a couple more wheelchair-using contestants popped up and were ruthlessly patronised by Charlie Dimmock. It strikes me that, up until recently, such instances of inclusion were few and far between. In 1996, I auditioned for Cilla Black’s Blind Date game show. At the time I was still firmly locked in the disability closet, uncomfortable with both my identity and association with other disabled people. 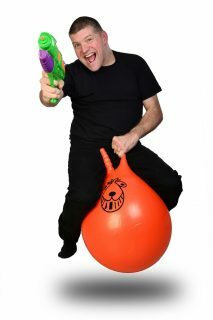 In my naivety, I thought it would be a novel idea to have someone like myself on the show, and was sure that no other disabled person would have thought of this. So imagine my surprise when I turned up to find a fellow wheelchair user at the audition. It then dawned on me that this was one of about twenty regional auditions, and that these auditions took place every year. So over its 20 year run, Blind Date must have turned away thousands of us. You’d have thought that a series actually named after an impairment would have allowed a few of us on the show, wouldn’t you? My next attempt at game show stardom was an audition tape for Big Brother in 2002, the first year Channel 4 targeted advertising in disability publications. 151 disabled people applied, but none of us were selected – and then a huge flight of stairs appeared in the house. The producers claimed there hadn’t been a “strong enough” contender. Given that after five series they still haven’t found one of us who fits their bill, I guess you’ve really got to question what they’re looking for! My final attempt came last year, when my wife Adele and I responded to another targeted advertisement – this time for Channel 4’s Location Location Location. Along with a number of other disabled friends, we were filmed for forty minutes talking about our ideal home. We thought that a programme covering the various barriers to finding an accessible home, set against the backdrop of our impending wedding, would have made interesting viewing. But once again the programme-makers abandoned the idea of having disabled people on the show, announcing that nobody “suitable” had come forward. 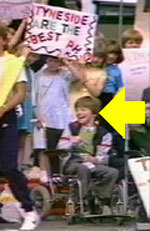 My one actual, bona fide game show appearance was on the 1985 special school edition of the BBC’s We are the Champions. Every year, this children’s game show included a segregated, special school edition at the end of the season, after the ‘real’ competition was over. Of course, because I haven’t got one of those TV-friendly, presentable impairments, my special school didn’t actually allow me to take part. But I could clearly be seen sat by the scoreboard, just under the elbow of the presenter, Ron Pickering! We were given the task of cheering on the school team. They came last. I guess the point here is that whilst the BBC and other channels are currently putting more of us on telly, they still seem to be picking the more attractive and ‘normal’ looking people. The rest of us – those with irregular bodies, visual impairments, learning difficulties and various other impairments – still don’t get as much of a look-in. For example, I largely attribute my game show failures to perceptions of my speech impairment, which causes me to speak a little differently to others. However, you could say the same of being from the north-east – it never stopped four series of Auf Wiedersehen, Pet being made! If Jimmy Nail can have a successful media career, then I don’t see why I can’t have one too!